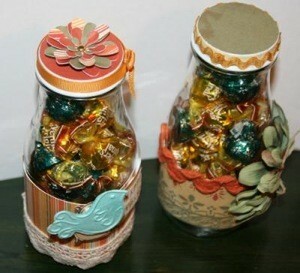 Super quick and cute way to recycle those cool shaped Frappuccino bottles. Clean and dry your bottle. Cut your scrapbooking paper to the desired size. Adhere the scrapbooking paper around the bottle. Adhere ribbon, lace, or fiber around bottle and cap. 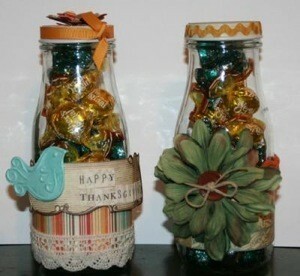 These were made for my children's teachers for Thanksgiving but you could decorate for any theme or season. So cute, bet they enjoyed getting them. See you at freebees. I have used them for bath salts, and body wash. I love recycling odd shaped bottles. Ok, regular shaped bottles, too.